Chad Channing is a teenage mutant who’s secretly been taken under the wing of Reed Richards. Reed – who is now a dismembered brain that sometimes arms itself in a Thing replica body – has been giving Chad placebo pills to replace his mutant suppresive pills that the government makes mutants take. Chad and Reed jump into action when the government’s peace-keeping Sentinels seem to be slacking – this time they stop an invasion by the Mole Man. But, Chad discovers that all of this super-heroing is negatively affecting his grades and his relationships with his parents and girlfriend. And, for what? Having not been old enough to remember the way life used to be, he’s not so sure that his role as an unlicensed hero is necessary – even though Reed tells him so. Days later, a giant monster is rampaging in the city – will Chad’s involvement show him that his role is necessary? Or will he throw it all away to live a normal life? Kirkman unravels the complexities of a Utopian society in this tale and shows you the weak points that value “upholding the law” over the lives of its citizens. The art is a bit cartoony and Chad’s powers aren’t specifically explained but those are minor grievances that don’t outweigh the great parts of this comic. The dismembered brain of Reed Richards is an interesting supporting character that connects Chad’s heroics to the Marvel Universe – and 2099 fans with eagle eyes may notice another character with the last name of O’Hara (a relation to Spidey 2099, mayhaps?). Underneath this fun tale of teenage-superheroics, there’s some subtle commentary on government-enforced Utopia that adds a deeper level of storytelling. Give it a shot! 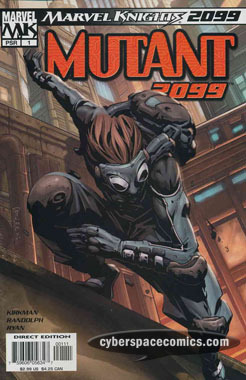 Note: To date, this is the only Marvel Knights 2099 character that has appeared outside of these one-shots. Robert Kirkman used him in Marvel Team-Up vol. III #16, 17, & 18.